All is quiet at the stone cottage near the per-way siding at Wallerawang. 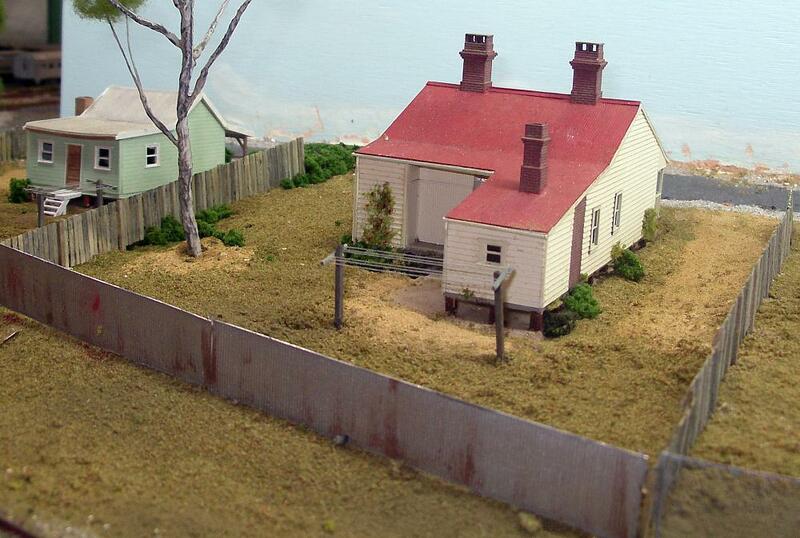 The main emphasis of work was to continue adding buildings and scenery detail items to improve the layout for exhibition at Castle Hill (24th/25th July) and Canberra (7th/8th August). 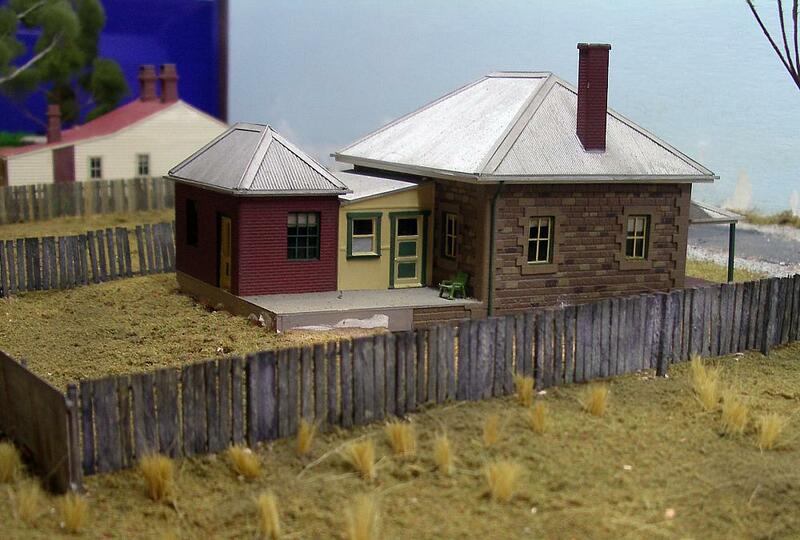 Two ready made scratchbuilt buildings were added to the Pipers Flat Road area near where the Mudgee branch swings away from the main line. The stone building represents the building at this location just past the per-way siding that was probably originally the station masters building, or it had served a similar function. The area needs more detailing but the addition of some Chucks Ballast for the gravel track, ground foam, and grass tufts enhance the scene. Houses along Pipers Flat Rd back onto the Mudgee branch line. The red roofed house was the second building purchased as-is. Timber stumps from stripwood were painted and added underneath, before the whole structure was installed. The smaller house to the left, a kit purchased from Casula Hobbies, makes up the third dwelling along this road. This house also had timber stumps added and a set of timber steps made up from stripwood and painted white, installed at the back. Old style clotheslines were added to the backyards. These were made from pre-stained 4"x4" stripwood posts and 3"x2" stripwood cross-arms. Grey cotton thread was strung through pre-drilled holes in the cross-arms and secured with superglue. The area around all buildings had ground foam and coloured plaster added to settle them into the scenery. The corrugated iron rear fences were made from a long strip of model corrugated iron, with stripwood battens glued to the inside to represent the timber framing, and the whole thing suitably painted and weathered. Paling fences made from pre-stained stripwood glued together with PVA, were added around the buildings. Local traffic near the roadbridge across the tracks at Wallerawang. Street signs were added to the intersection adjacent to the road bridge. The signs were made from digital photographs of the real signs at this location. These were printed to the appropriate scale (RTA and Australian Standards were consulted to ensure we got the size of the signs correct) and the prints were stuck down to thin styrene sheet and carefully trimmed with a sharp scalpel. A piece of copper wire for the posts was stuck to the back of the styrene signs and once dry the posts and backs of the signs painted a metallic grey. The whole assembly was then glued into small holes drilled into the scenery and the signs propped up until the glue dried. 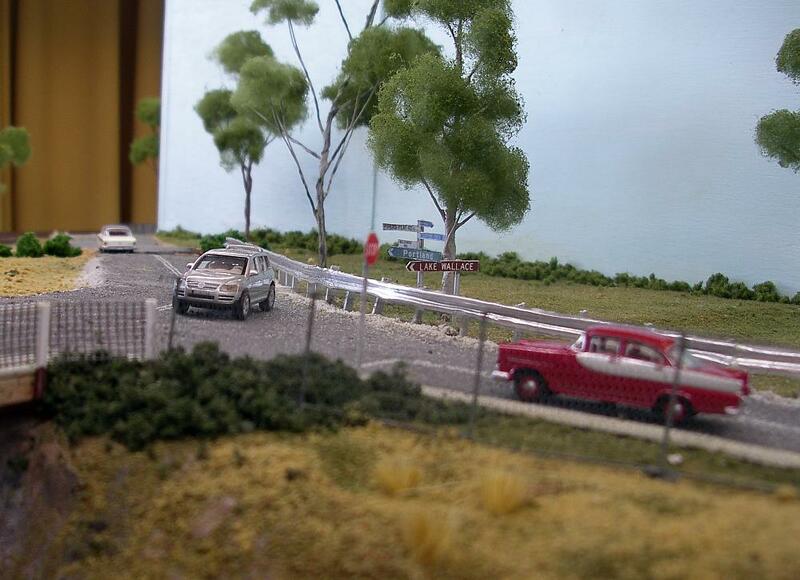 The chain-link fence seen in front of the old red Holden and to the right of the goods shed was scratchbuilt from copper wire for the top and bottom rails and individual posts were soldered on at scale 8 feet intervals. Tuile (bridal veil) was stuck to the copper wire with contact cement and when dry the whole assembly was airbrushed a metallic grey. Every 3rd post was left long at the base past the bottom rail for fixing to the layout, and was glued into holes drilled into the scenery. More of this type of fencing is needed on the opposite side of the roadbridge. 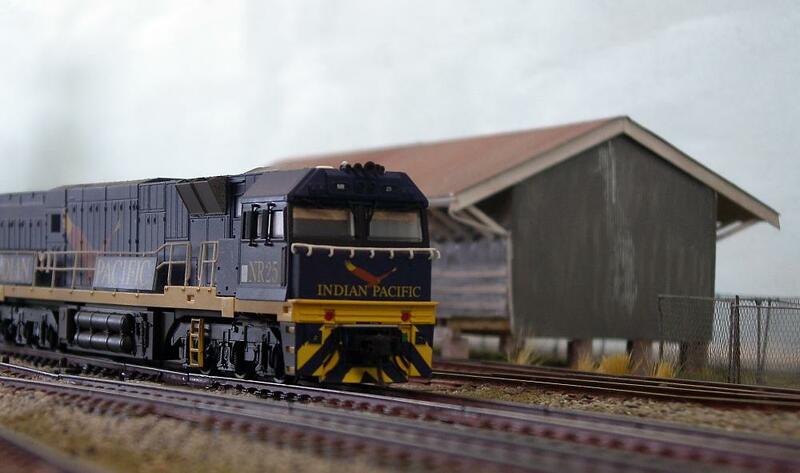 NR25 hauls a Sydney bound container train on the Up Main past the Wallerawang goods shed. The newly installed chain-link fence can be seen to the right of the shed.